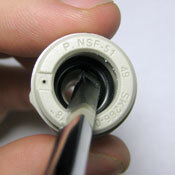 Use a thin bladed screwdriver, a toothpick, tweezers, or some other thin tool to pull the o-ring out of the fitting. 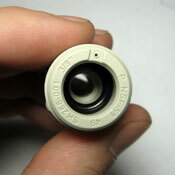 Be careful not to damage the fitting, but don’t worry about the o-ring. You're going to throw it away. John Guest fittings have a single o-ring. Mur-lok fittings have two. Trim 1/2" or so off the end of the tube to give the fitting a new surface to grip. Get a good square cut on the tube. 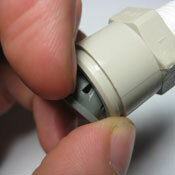 Insert the tube until you feel it hit the bottom of the fitting, then turn the water back on.